Getting there: From I-35 head west on Parmer Road. Turn right onto FM 1431 and then left on CR 175. Look for the park on the right and turn right onto Perry Mayfield Blvd. to get into the park proper. The first parking area on the right is the trailhead. Watch out for trains at the train crossing, and be sure to wave to the kids as they pass by. 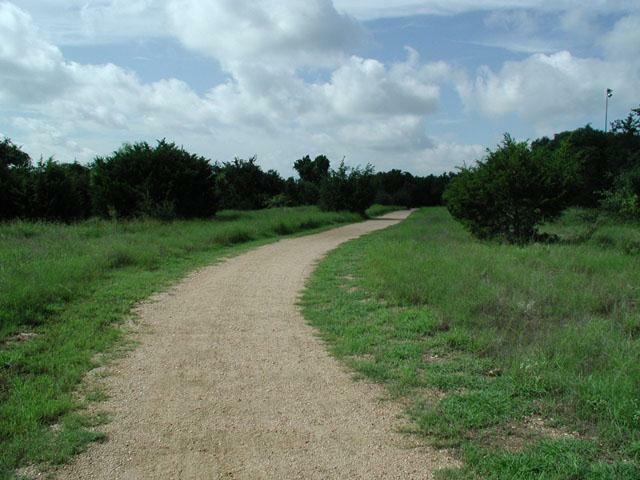 The Hike: The Williamson County Regional Park is one of the newest parks in the greater Austin area. The parks boasts a wide variety of features including football and baseball fields and basketball and tennis courts. Even with all of the amenities currently in place only about 100 of the park's 800 have been developed. My trip was concerned with the trail system at the park. There are two trails totaling four miles, each of which begins at the waypoint "Trailhead" on the topo map. The first, and most commonly used, is the crushed granite hike and bike trail that circumnavigates the developed portions of the park (This is shown in blue on the topo map). The path is well maintained and as flat as can be. Most of the people who use the trail are joggers. Though the trail usually passes by the numerous playground fields, it also darts through sections of trees that provide a moment or two from others' view. 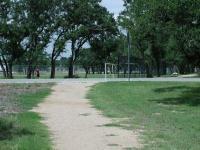 The hike and bike trail part of the trail system encircles numerous playgrounds and playing fields. Watch out for trains! 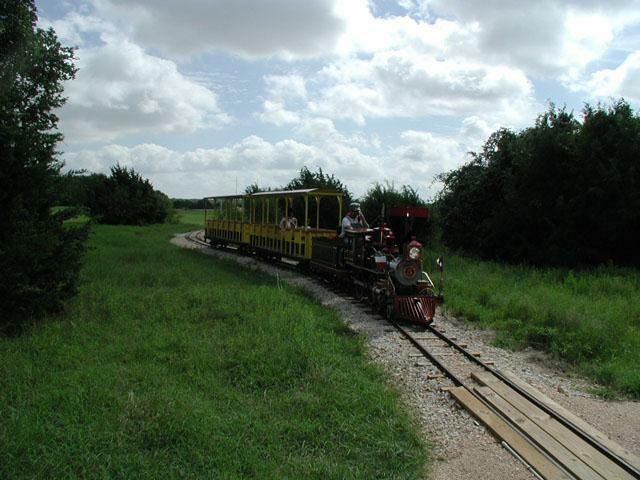 Like Austin's Zilker Park, Williamson County Regional Park features its very own small gauge railroad that provide rides for kids around the park. There is one rail crossing along the trail. Be sure to wave as they go by. Starting at the same trailhead as the hike and bike trail is the little known nature trail (This is shown in red on the topo map). One of the reasons it's not well known is that it's hard to find. Standing in the parking lot across the street it's easy to dismiss the existence of the trail on other side. Only when crossing the street was the trail apparent. The hike and bike trail still manages to provide a bit of solitude here and there. Unlike the hike and bike trail, the trail surface is mostly mulch, and a thick application of it at that. Anyone with foot or joint problems would appreciate the spongy feel of the trail surface near the trailhead. The trail is wide and surface flat, like the rest of the park, so don't expect too much trail difficulty. The nature trail portion of park was completely empty and the mulched path made the going easy. This is where to find solitude in the park. The nature trail forms a semi-circle that rejoins the hike and bike trail to the east. The nature trail ends at the waypoint "Nature Trail Ends". Here it empties out into one of the streets in the park. One can either double back towards the trailhead and make it an out and back hike, or head southwest down the road for a bit until it crosses the hike and bike trail at the waypoint "Rejoin Trail". There are no grand views given the flat terrain, but there are some pluses that shouldn't be dismissed. While on the nature trail I didn't see another person. Furthermore on a previous trip I also encountered no one else. That's not too shabby for a park in a fast growing area. How long will it last? The park overall is remarkably underutilized, compared to others in central Texas. I think that park administrators have wisely planned for the future and expect more and more people to discover the many recreational opportunities that "Wilco" has to offer. This trail is great, if you notice on the map the white trails, those are singletrack (mostly) so in total, 2 miles of mulch, 2 miles of crushed granite, and another 2-3 miles of primitive singletrack. Good for mountain biking, running, and hiking. On my run this morning, saw 5 deer, 2 people, an 2 dogs. some evidence of wild hogs, but I run out there all the time and have yet to run into any. Walked this out today and i have to say it was pretty enjoyable. I was out there around 1pm and didnt see anyone on the hike and bike trail untill i was done. I walked down on which seemed like a dirt road about 1 mile then turned back around, cause i wasnt to sure if it was the nature trail or someones propertry. Now that i read Riffraffs log I found out it was the nature trail, so I intend on going back. Riffraff had an EXCELLENT description of how to find the nature trail. On a 65-degree Saturday we only encountered a pair of bikers and no one else on it. Coming back on the other trail, we pass two cricket games and the train, and many soccer games. Doesn't rank among my favorites but I liked it enough to want to go back every now and then. Very isolated for its location. No water but the trees made it a nice one-hour hike. Great place to go for a walk but don't expect solitude or exploring. It is a good place to let the kids do some exploring or bike riding and the train is a nice treat too. 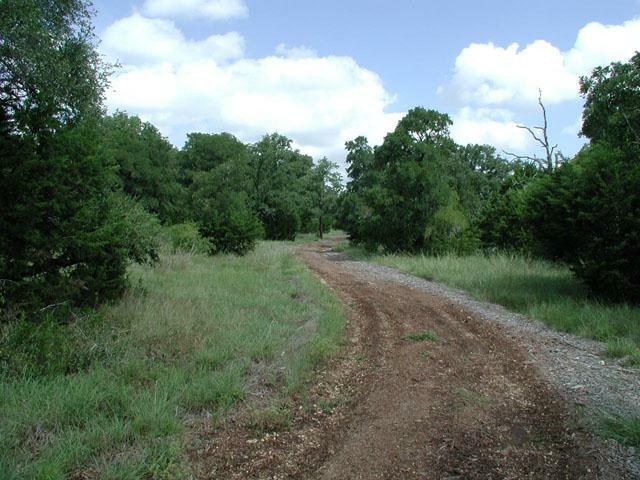 This trail is wide and easy for joggers or dog walking. We saw several people with small children enjoying the lovely weather. There was even one horse & rider. I thought it remarkable that so few people were enjoying this trail which is essentially in a very urban area. One caution: There are NO signs to route you. This is my getaway spot. It is very close to my house and so when I need to getaway and retreat I find myself walking here. gives me a sense of a hike without exerting much time and thought. I love it and will be back often.